Tamildict.com is not only an online dictionary. It's the attempt to create a platform where users from all over the world can share their knowledge in the field of translations. Every visitor can suggest new translations and correct or confirm other users' suggestions. There are several possibilities to support the project. If you consider tamildict.com to be useful and worth your help, it would be great if you could join the community of contributors. We are looking for Software Developer, who can support our Tamildict Project. LingoPad is a offline multi-language dictionary for looking up translations without being connected to the Internet. This "LingoPad" is available for free and can be downloaded at http://www.ego4u.de/en/lingopad. 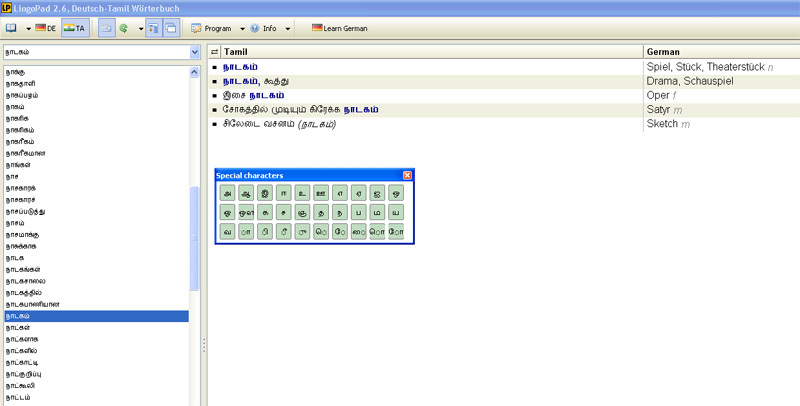 The Tamil vocabulary database is not contained in the program and has to be requested from Tamildict.com in a second step.If you make a Donation of 20 Euro we will provide you our Tamil vocabulary database. In case of any questions regarding the program, please contact the author directly. And most important: Many thanks to the users of tamildict.com for supporting the project by giving e-mail feedback, linking to tamildict.com, improving the vocabulary and answering translation related forum questions!